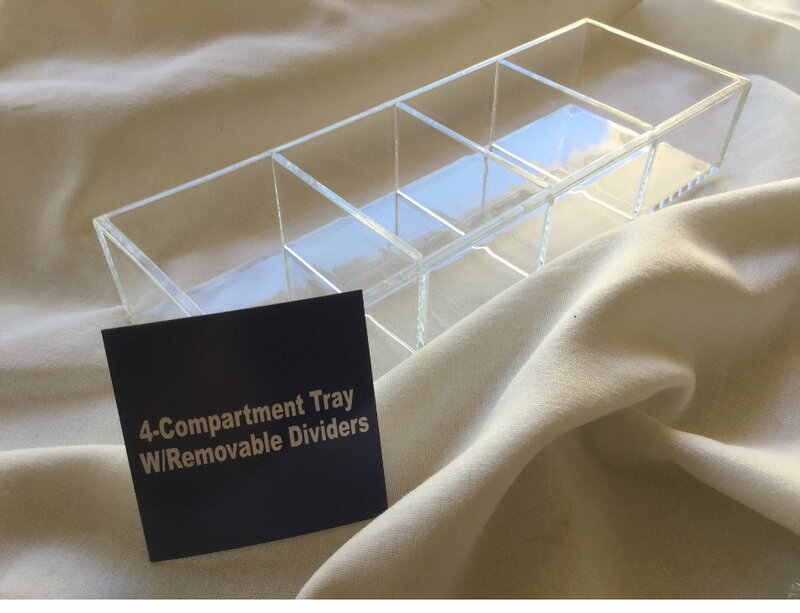 Adjustable and completely removable center dividers convert this clear acrylic 4-compartment tray into a 3-compartment, 2- compartment or 1-compartment tray. Protective clear & mar-proof rubber bumpers soften the resting area between the tray and the table surface while the long ( one foot long) tray provides 36 square inches of storage and adjusts per your needs. Remove all the dividers and you'll have 90 Sq In of volume storage or sub divide the same space into 4 equal, smaller compartments. Each tray comes individually polly wrapped and gift boxed. Limited quantities available so act fast.